It’s Valentines day, and to show our customers how much we love them we stayed up all night putting the finishing touches on a brand new theme! I am excited to announce the release of StyleShop. This robust and beautiful eCommerce theme is built on WooCommerce, and offers a power suite of tools for running an online store. 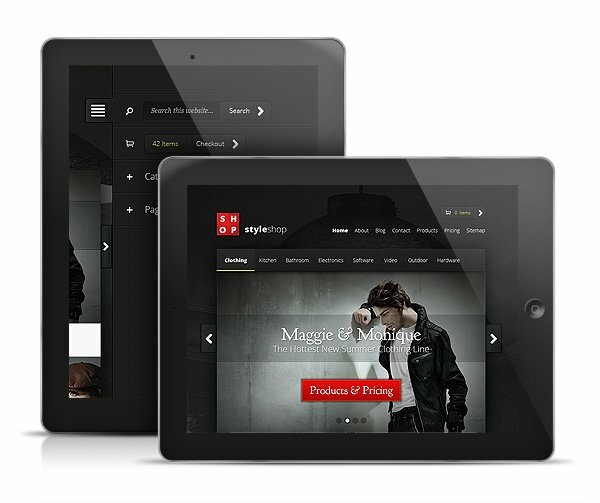 Unlike our previous eCommerce themes, StyleShop is fully responsive and offers a unique mobile menu that makes browsing your store on mobile devices easier than ever. StyleShop also makes full use of the WordPress Theme Customizer, allowing you to quickly change the colors of your fonts, background, navbar, footer, and more! The use of mobile devices is on the rise, and it is important for your website to be ready for those mobile visitors. 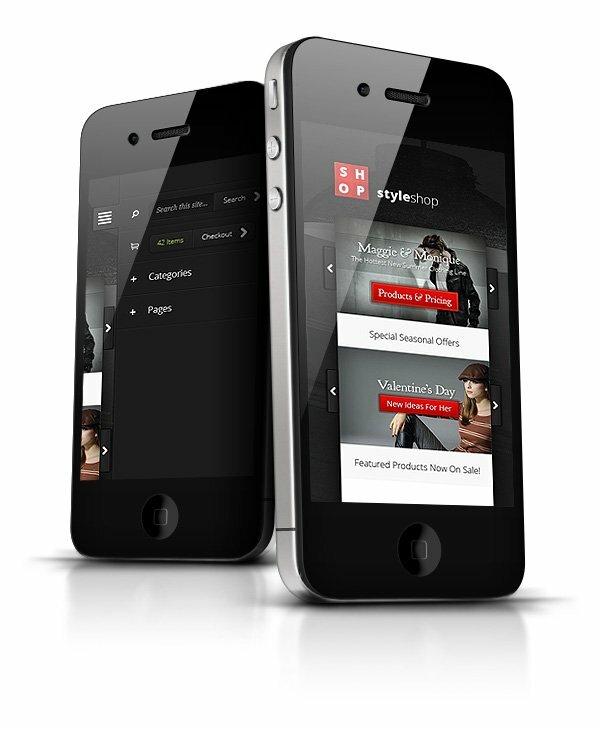 StyleShop comes fully responsive, meaning that the design will adapt to whatever screen size is being used to browse. You website will look great and will be a breeze to read on mobile phones and desktop computers alike. And let’s not forget about tablets! StyleShop will also look great on your iPad or Android tablet in both portrait and landscape mode. StyleShop allows you to easily customize your theme’s colors and background images via the WordPress Theme Customizer. You can quickly change font colors, navigation bar colors, background colors, background images and more. Same here. I have been waiting for the release of this theme since its sneak peek wad released. And I must say, it looks much better then expected. Great work ET! New Modern and stylish for any eCommerce store. There is a little bug with the “closing button” the X in the modular popup in the review. i can’t download the theme. archive seems to be broken. someone was able to? The download is working now. Sorry for the trouble. @adrian, yes the archive does seem broken. I can only download the PSD as well. Any update on when we will be able to download? So SWEET of you to make it available on Valentine’s Day, thank you. The archive is broken, I am experiencing the same issues. Please advise as to a solution. Sorry about that. The download is working now. Great theme. I love it. especially the focus on details. I tried to download…seems your zip files is broken. by the way, this themes is awesome! Really nice take on woocommerce Nick. Your themes always rock. Would it be a royal pain to shorten the home page slider by a lot. The one thing all my customers complain about is that the pages are too deep. I always need to keep in mind that a lot of end users don’t like to scroll. Many many new themes require a ton of scrolling. I’ve worked with code settings in the past to adjust slider sizes, but sometimes it’s a real tough job and not worth the time. Awesome theme, graphics, and look though! Yes, i agree. It would be great to adjust the Slider Size in the appearances tabs rather than recoding. For now though, what is the code and can you resize with a SmartCode? Really nice product you made there Nick! Quick question: do you plan on developing any eCommerce plugin ? That would be really nice imo. are there still any compatibility issues that will be solved in a future release? If you open a thread in our support forums, we will be able to better-assist you with any problems you are having. Hope you got the errors ironed out! Did anybody notice the side menu on the phone size version?? That’s just jawdropping awesome! Kudos! a truly awesome WordPress site design at its best. An amazing eCommerce theme that I’m waiting for! An awesome eCommerce Theme! I’m going to add the theme to my eCommerce WordPress themes collection. Btw, I don’t see StyleShop in this category http://www.elegantthemes.com/gallery/category/ecommerce/ . Is it waiting for any new update? One of the best eCommerce WordPress theme that have released in recent time. Good luck with the sale. Nice eCommerce and grate to have it has responsive.. This is a beautiful e-commerce theme with a contemporary and slick design, Nick. Hats off! You rock, Nick!! Just two days ago I was tweaking your nimble theme to fit with Woocommerce, and wondering if you might start using Woocommerce one day… then BANG! You hit me. BTW was this our valentine’s day present? I struggle to imagine what you gave your girl that could be better than this theme… you’ll be in trouble if not careful! For your 1st e-commerce theme, it’s amazing ! Congrats ! Its a lovely theme that is developed. I checked out the demo and there is one thing that is missing from the demo is that there is no product zoom in. Multiple images and what ecommerce plugins are compatible. Could have added this. Awesome! Great to see a different and creative responsive design from you guys! You just made this the best woocommerce theme available. It’s that simple. I just wish there was a way to adjust the height of the home slider, and a way to push the entire site little bit upwards, there is too much space in the “header” section. I hope you will create more woocommerce themes, as this is taking over as my fav. e-commerce solution. Mt previous ones were Opencart and Prestashop. You just forced me to renew my subscription when the time comes… excellent job, I’m a very happy and excited customer right now !!! just trying to help your Peeps Nick Roach as I know many felt same way and will thus Luv your work even more! NOW I am back aboard and fired UP for Elegant Themes!! Truly best design and creativity is put in the development, i love your unique concept. StyleShop – Another awesome theme! It looks great!Just love the design. You guys rock..
Again thanks for another great, clean, stylish and awesome theme Nick! OMG can I say I love you guys!!! I’ve been trying to find a suitable theme for my blog for about a month and nothing suited. But this is perfect!! You have out done yourself as usual!! You can either raise your server’s upload file size limit, or you can use FTP to transfer the theme files instead. The theme works with WooCommerce. This is really really good looking! I will probably use it for my next project, it’s actually perfect for that. I would love to see as standard more effort and design/ functionality made available to the contact / location pages. Another great design Nick, they keep getting better and better – I am just using the Lucid theme now for a new client Online Football Betting and it is very easy to work with and change the look of the site. good work – nice design! For european markets we need some additional features, for legal aspects! Nick, this theme is one of your very best. First time I saw it, it really smacked me between the eyes. A real attention grabber! Nice! Theme! I Am Like!! Awesome job guys. I really like the part where of the menu button and the sidemenu for mobile devices, hope to see this more often in your themes! Very nice woocommerce theme. In a future plan to update my website, I will consider StyleShop. Good template for e-commerce. Very flexible internationalization system. Will this theme get updated soon to be compatible with Woocommerce 2.0.2? I have been testing it, and so far there are a lot of minor issues with things not lining up properly. Thank you! So fast and awesome. I love you guys so much! Hey, the theme is broken now, with WooCommerce 2.0 … The hot new items section shows $0 for the price incorrectly, and the green sale buttons are all out of alignment, and other miscellaneous errors. 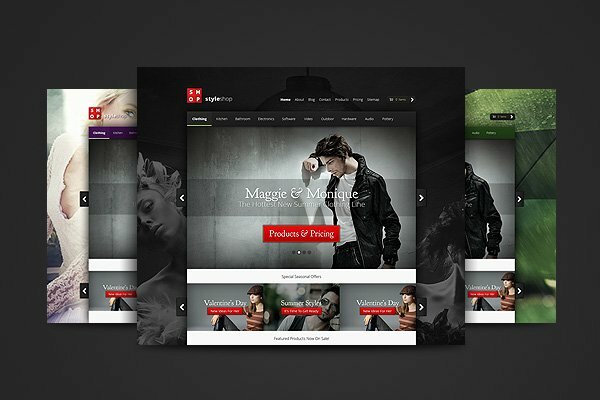 The theme has been updated for WooCommerce 2.0 compatibility. Please update the theme to its latest version. I seem to have a problem where the price on the homepage showing 0 when there is a price on the products page. Have you come across this before? Instead of the items ending up in four columns they are listed in one column down the page. Am I doing something wrong? I love the theme it looks classy. I bought this WP theme last week and within 4 days of development (part-time), I have a few parts to adjust and I will start my own clothing and shoe store. With shortcodes, widgets and customizable elements, it was a breeze and mostly very cheap for what it is. You know what, it’s really the best, the design looks promising, etc ,etc. I was searching for a product showcase theme supported by WordPress and i came across this theme . I am willing to purchase it but in the theme is it possible to remove the add to cart feature and to jut showcase the product along with the price, description and product code only. no add to cart and no checkout option. Just got round to seeing this theme .. looks very nice and clean layout. My colorization panel is not showing up in the epanel. Do I need to update? Would like to have it for client use. Color customization is handled via the Theme Customizer as outlined in the readme. I am not getting any option to upload Products in Style. Please help me. very nice collections of eCommerce. thanks for sharing. these themes are very useful! If you need help, please open a thread in our support forums so that our team can assist you. Please, how can i use standard WP background changer? In Styleshop we can only change image. I need to pick small image and repeat it in X and Y. Your reply wasn’t deleted…all comments are manually approved here the first time you comment. You just need to be patient. THe theme does not come with such options, so you would need to modify the theme code in order to adjust these area. Great Theme. guys how do i remove cart icone from top right corner? any1 got any ideas? Hope to fix this soon. Thanks in advance. I’ve just a little question: wich e-commerce plugin should be used according this theme? If you need help, please open a ticket in our support forum so that our team can assist you. Hi. First of all this theme is great, I am really happy with it. Just found a bug and was wondering if you could help me. On certain pages, the featured image appears on top of the page: http://shoes.vibranto.com.au/about-us/, this was not happening before, but now I cant get rid of it. Hi Nick, just loved the eCommerce themes. Will try this out in my websites.Thanks for sharing this blog. Awaiting for more beautiful blogs like this. No One is answering in my support ticket, so I’d try my luck here. I have been using this theme for a while and just noticed that although it loads okay in most mobile browser, on iphone the product description doesn’t show. If you have opened a ticket then it should be answered shortly. Most tickets are answered within 24 hours, unless they are customization related. You’re wizards when it comes to creating awesome looking themes. Would be perfect for my newest wordpress shop. Hi Nick, is it possible to change the background image ? I need a white background… but couldnt manage to delete the image from the CSS. Any advise? This theme is very nice. I am using it at the moment for one of my websites, and I will be using it in the future as well. I’m no longer a subscription holder of Elegant Themes and can not access the support forums to help fix bugs/issues I’m experiencing with this theme. I had a few questions. 1. How can I access help files/forums to help when I have issues? I downloaded the theme a bit again and just now running into issues. I didn’t realize I would not be able to access these resources once my subscription ran out. I just need help using it…. and I haven’t even got to the shopping cart of this thing and very fearful I’m going to be completely lost setting it up. I do rely heavily on help/forums when putting content onto a wordpress theme. I am afraid that we can only offer support to active customers. If you would like to continue using our themes, then it’s recommended that you pay for access to our service. Great theme yet again Nick. Elegant Themes’ work really is top draw. We’ve disabled the WooCommerce part to this theme for the time being but the ‘brochure’ set up is working really well for us. This is a beautiful e-commerce theme with a contemporary design. Nice Work! Some beautiful themes you got here. Got a quastion, lets say i pay the $69 for a year for the personal use of the themes. And then when the year is over and i decide not to pay again, am I still aloud to use the theme? Hello, I have used styleshop before and it is a very good theme. But why is it categorised as “ecommerce”? I can’t see any features that are different from your other great themes. Or is it that is has been coded to integrate with WooCommerce specifically? Won’t your other recent themes work with WooCommerce. I’m just wondering if I have failed to activate some settings? Thanks. I would like to make some changes on my site, namely to remove the product reference on the products that show on the feature slides. can you help with that, please? How to change the primary menu fonts color? Paddy you can change the menu font colors in the CSS easily. When has the theme last been updated. It’s not apparent to me whether the theme is still being updated (at least with security patches) or if this theme will soon be retired. I’m thinking of buying this theme for a new project. We keep all our themes up to date to ensure that they are compatible with the latest version of WordPress. The last update was made last week for WordPress 4.3. Great theme – Is there a (floating) social counter or social share build button in the theme? No but you can use our social plugin Monarch.